The POS-X Xr200 has been discontinued. No direct replacement is available. 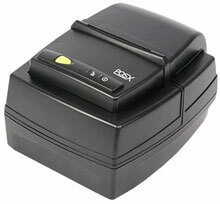 The POS-X Xr200 Impact Receipt Printer is built to last. Its thick casing dampens sound, making the Xr200 the quietest impact printer in its class. Two-Color printing, RJ11 Cash Drawer port, OPOS drivers and up to 3-Ply printing are among the Xr200's many features. Boasting a splash-resistant housing and wall mount capabilities, it is the perfect choice for kitchen areas and other hot and humid environments.